Some cooking smells are like snatches of old songs – they take you right back to a certain time and place. And that may be a good or bad thing, depending on the aroma. Stewed cabbage and I’m in the dining queue at school – bad! Garlicky fresh sardines sizzling on a plancha – it’s that little wooden beach cafe in Calla Bassa, Ibiza on a really hot afternoon in the late 70’s and too much sangria – definitely good! 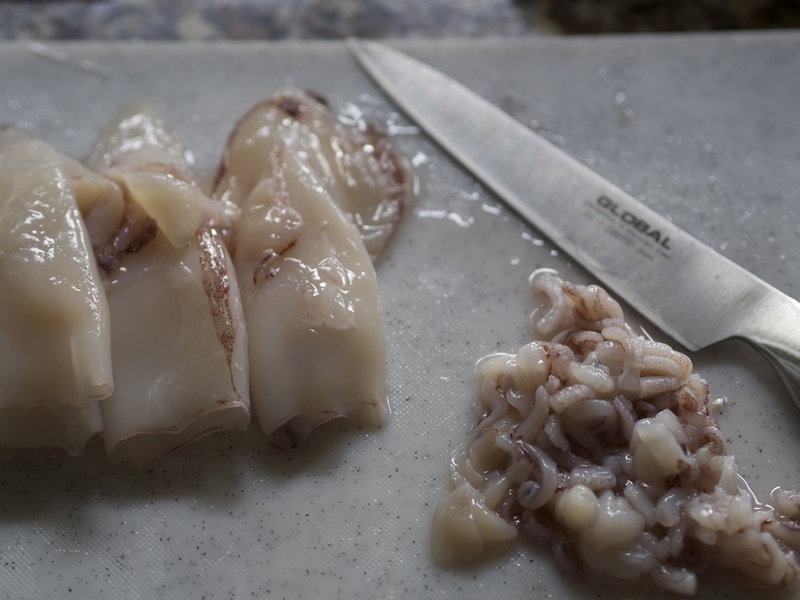 So when I saw wonderful fresh squid at Penshurst market a couple of Saturdays ago, a strong desire to revisit a particular place from the past, and its scent, took over. Let me set the scene for you. At the beginning of the 80’s I was living on Efate, the main island of Vanuatu, in the South Pacific (it’s a long story which I will tell here some time – some good food memories there). A year in and going a little stir crazy, we escaped from the island for a bit of R & R in Sydney. The food was spectacular – Greek, Italian, Vietnamese, and good old superb Australian meat and fish – all eaten in cafes and eateries set in the district of the city where immigrants from those countries had settled. So you could tell exactly where you were from the smells emanating from the restaurants. One evening strolling through what was patently little Italy (but the antipodean version ), we stopped at a likely-looking cafe transported straight from the back streets of Naples (and the song keeps running through my head but I can’t remember who sang it), and ordered the fish of the day. They bought out a dish of little squid stuffed with their own tentacles and served in a simple tomato sauce. I’ve never forgotten it – there are some things I’ve eaten that will always have a place in my food memory bank, and this was one of them (maybe because at that time back in England really good fresh squid was not something you came across – ever). I found a recipe somewhere in a magazine or book – I can’t remember exactly where but maybe from American Gourmet magazine which my mum sent out to me from New York in a monthly bundle to help me keep in touch with the real world, at a time when airmail was the quickest way to keep in touch. Anyway I copied it out into my recipe scrapbook that had been shipped out from home with all my other essentials, then I cooked the dish up in my little South Pacific kitchen – and it was sensational. But I’ve only cooked it once or twice since. Spotting the fresh squid on Paul’s stall brought the recipe – and its memories – back into my mind. 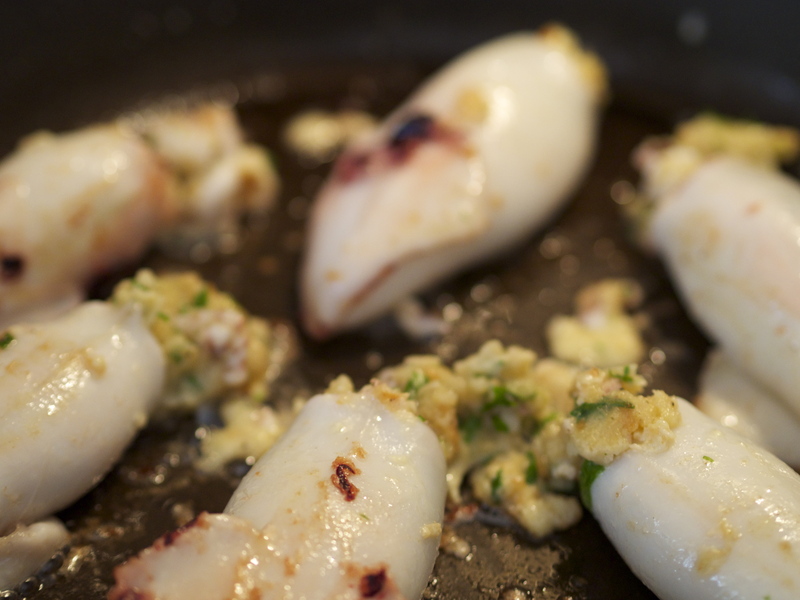 So last Saturday night was a long haul down memory lane – and neither the squid or the recipe failed me. 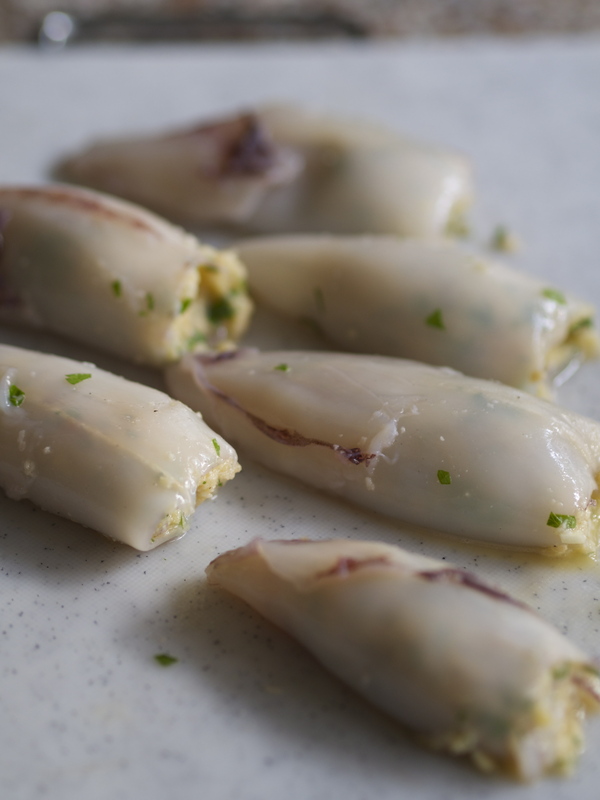 I’ll make a few tweaks next time I cook it up but here it is with some tips on preparing and cooking squid if you haven’t tried before. The most important thing is of course to get the freshest best quality fish – Paul at Penshurst is always a safe bet for me but I wouldn’t bother with this dish if you aren’t as confident of your supplier. I used 6 squid as the recipe suggested but would do 8 medium sized squid next time to serve four. 1 First skin the squid. The pinkish skin on the body simply peels away in rather a satisfying manner but you can leave a little if doesn’t all come away cleanly. Tug at it gently and rub any pieces that stick. You don’t need to skin the tentacles! 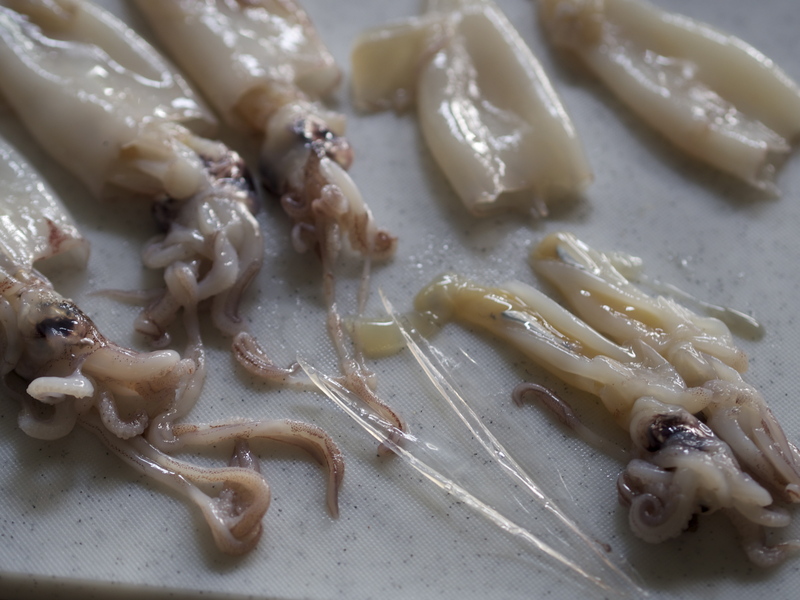 These squid have been skinned by Paul the fish. You can still see a few traces of the purply brown opaque skin on them which I just rubbed off. 2 Gently pull out the heads, stomach and tentacles – you want them to come away in one piece along with the strip of clear cartilage that runs the length of the body. The cartilage will pull away if it doesn’t come out with the rest of the insides. Rinse the body cavities and pat dry with kitchen paper. 3 Cut the tentacles away from the head with a sharp knife, taking care not to cut through the ink sac as it will bleed black squid ink everywhere. Discard the head and internal bits and chop the tentacles. 4 Mix the tentacles with the stuffing ingredients as directed including the egg which got left out of my written method. I added a few more breadcrumbs as my egg was large and the stuffing was a bit wet. 5 Push the stuffing into the cavity of the squid making sure it goes right down to the bottom and press the opening together. You can keep them closed by threading wooden cocktail sticks across the opening, which stops the stuffing oozing out when the flesh shrinks up when frying but I didn’t bother. I just ended up with stuffing in my sauce – not the end of the world but I would seal them if entertaining friends with this! 6 Make the sauce – the recipe tells you to cook the garlic for 5 minutes over a medium heat but I only did it until the cloves were golden brown. Any more and they will turn bitter and ruin the sauce. 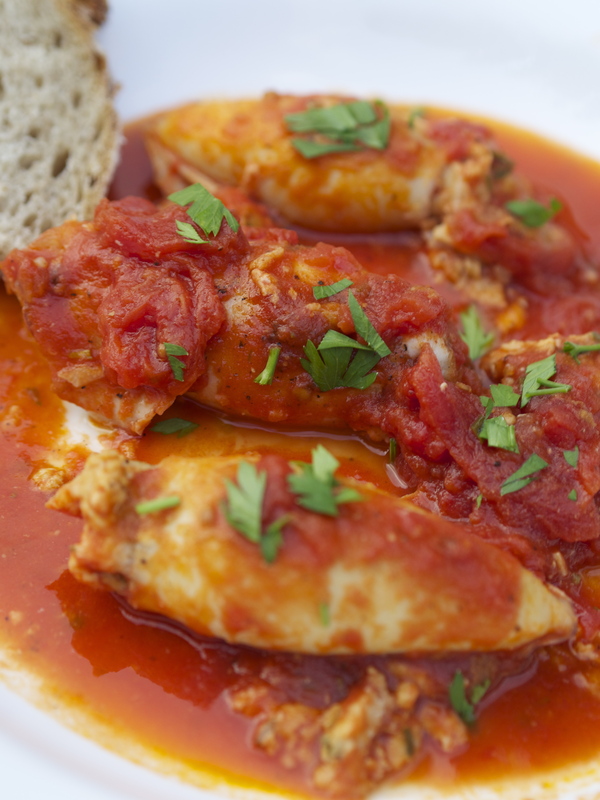 Use good quality Italian tinned tomatoes for the best flavour. And I used about a tablespoon of chopped fresh rosemary rather than a teaspoon of dried – those were the days when we used little amounts of dried herbs. Aren’t we lucky now? I have a big bush of rosemary in my herb bed and fresh herbs available in most shops. 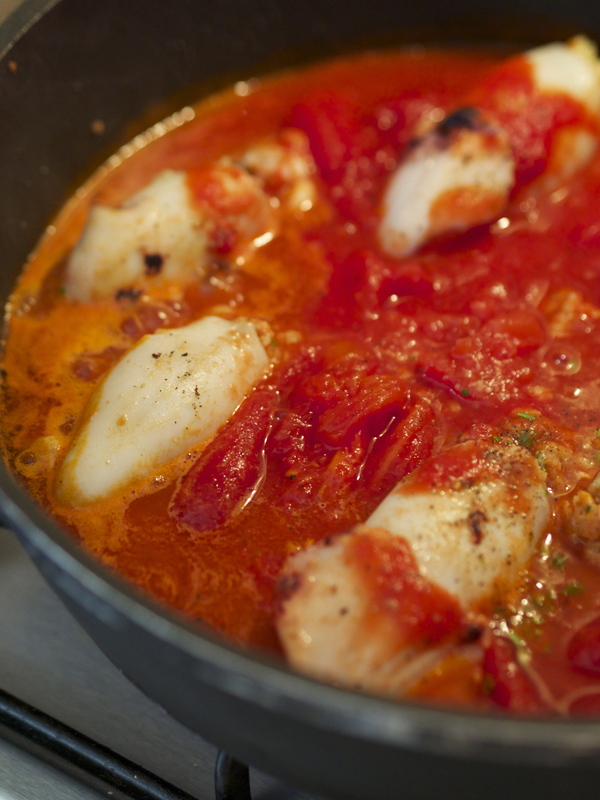 And simmer the squid in the sauce gently – you want all the lovely flavours to meld together but not let the squid get tough. 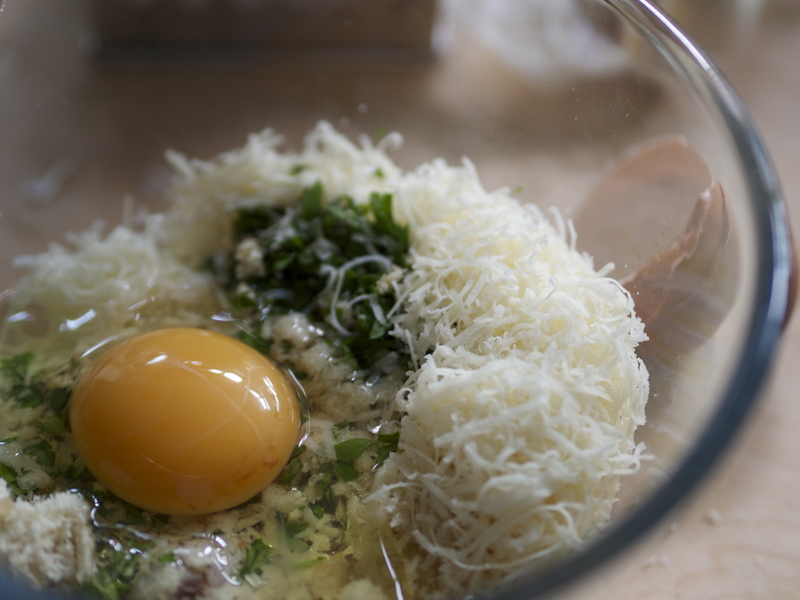 7 Scatter with chopped parsley and serve in warm bowls with good bread to mop up the juices and a glass of chilled Provencal rose. And enjoy a perfect summer squid dish in the sunshine. And if there are any leftovers I would slice up the squid, reheat very gently in the sauce and toss with spaghetti for an easy supper. 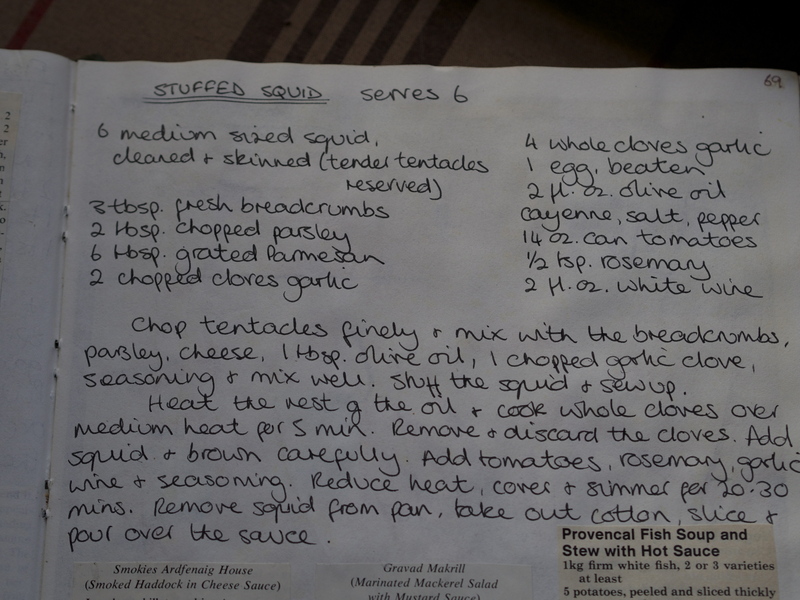 This entry was posted in Farmers Market, In season, Recipes and tagged Arcade Fisheries, italian cooking, Penshurst, Recipe, squid, Stuffed squid. Bookmark the permalink. 2 Responses to Squidly diddly…..